I want to encourage you. Hopefully some small thing that we share here on the blog will bring you joy, give you hope, or challenge you to turn to Christ for strength. I have been so blessed by each one of you that responds to this blog, either through a comment here, a Pin, or a share on Facebook. When we read our Bibles today, we see Chapter and Verse listings that were not there in the original text. While those markers help us find a specific area of the text faster, like during a Sunday morning service, we need to be reading the whole book to give us the best opportunity to listen to what God wants us to hear from Him at this particular time in our lives. Sometimes a whole chapter, or even a book, gains significant meaning as the Holy Spirit is teaching us and refining us. At other times, it is just a phrase or a single sentence that God uses to point us in the direction He wants us to go today. Each day on this journey is different. With both of those thoughts in mind, I am going to share some of the portions of Scripture that God has been using in my life recently. 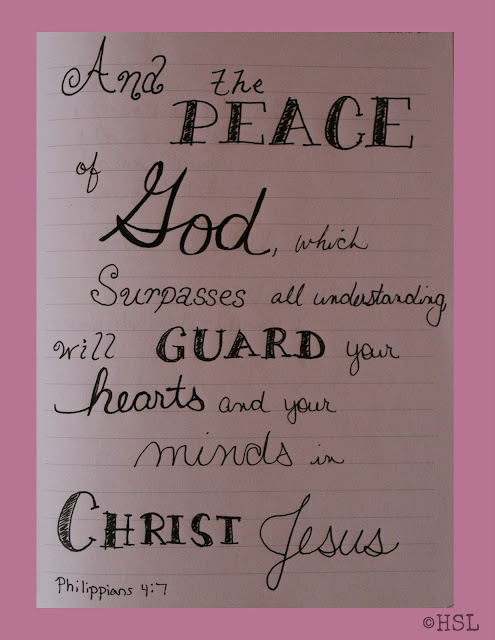 They are just snapshots out of my Bible notebook, but I think you may find one that encourages or challenges you too! You can look for them on Sunday, Wednesday, and Saturday, at least through this Fall, and maybe further. Read the Word of God. It changes you! Are you looking for an adventure? Time for a Road Trip? 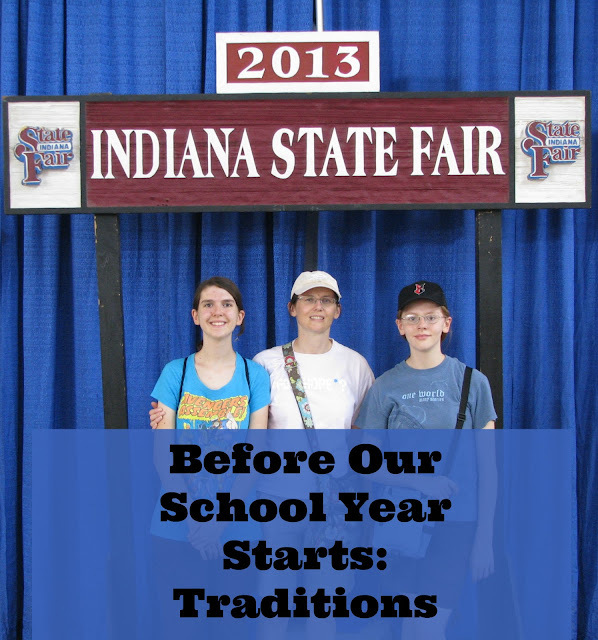 It's not too late to visit the Great Indiana State Fair! This year's fair continues through Sunday, August 21, 2016. If you've never been to a big State Fair, you are in for a treat! You'll need at least one whole day to visit the Indiana State Fair, but a two days visit is even better. There are always so many things to do at our State Fair. See the animals, ride the midway rides, view the 4-H projects, visit the DNR building, and then grab a lunch of fair food! If you're on a budget, pack a picnic lunch and just get fair food for dessert! For the BEST dessert, visit the Dairy Barn! 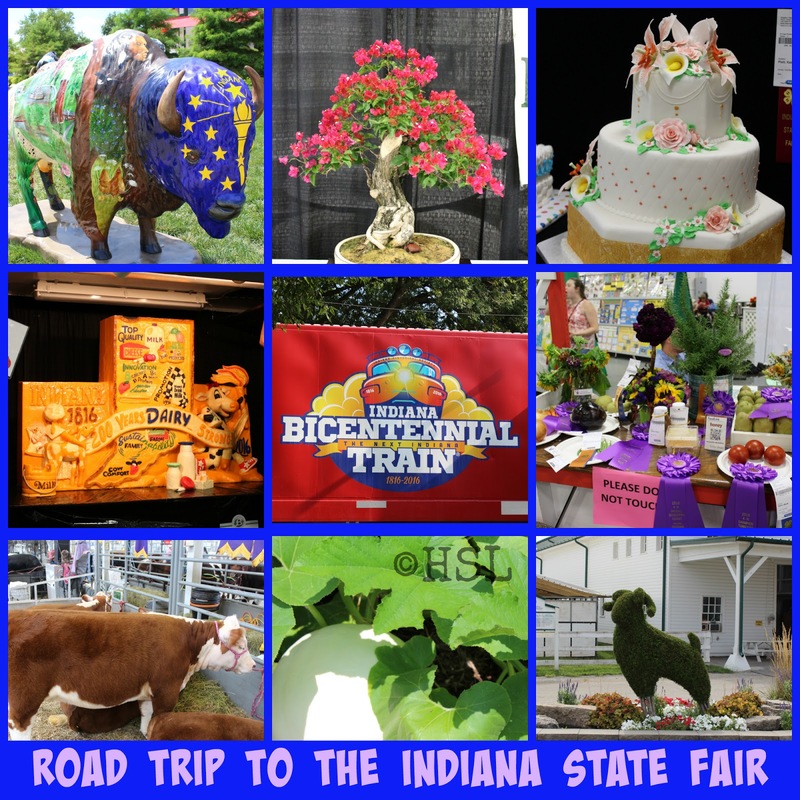 The 2016 Indiana State Fair is a two week long celebration of Indiana's Bicentennial year. There have already been hundreds of events going on, with more fun happening every day. The Indiana State Fair has a website, as well as a free app so you can plan your day, and double check to make sure you won't miss your favorite shows! The beginning of the Fair is probably Emily's favorite time, as it encompasses the 4-H Fashion Revue, 4-H Animal shows, and the opening of all the exhibits. This second week of the fair might be Arlene's favorite time because it is the week of the Draft Horse shows. We've visited the Fair as a family ever since Emily was a baby. Sometimes once, but usually two or three days throughout the fair. This year, you don't even want to know how many times we're going-LOL! When the girls were little, their favorite place to visit was Little Hands on the Farm on the East side of the fairgrounds. If you have young children, this is a great place to go in the morning when they're fresh and ready to explore. They also always want to go through the Pioneer Village and visit the penny candy store ~ imagine that! They still go to Pioneer Village, even though they've grown too big for Little Hands on the Farm. As a family, we like watching the animal shows in the Coliseum, as well as visiting the Pathway to Water Quality. If you're looking for a spot to take a rest and relax, visit the DNR building and watch the fish, find out about Indiana's natural resources, or just watch the butterflies in the outdoor garden! Do you like seeing artwork, rockets, or photography? The 4-H exhibit halls at the fair are packed full of all sorts of great projects: woodworking, cake decorating, sewing, flowers and more! Come see the Bicentennial Bison, the giant cheese sculpture, or visit the Bicentennial Train! 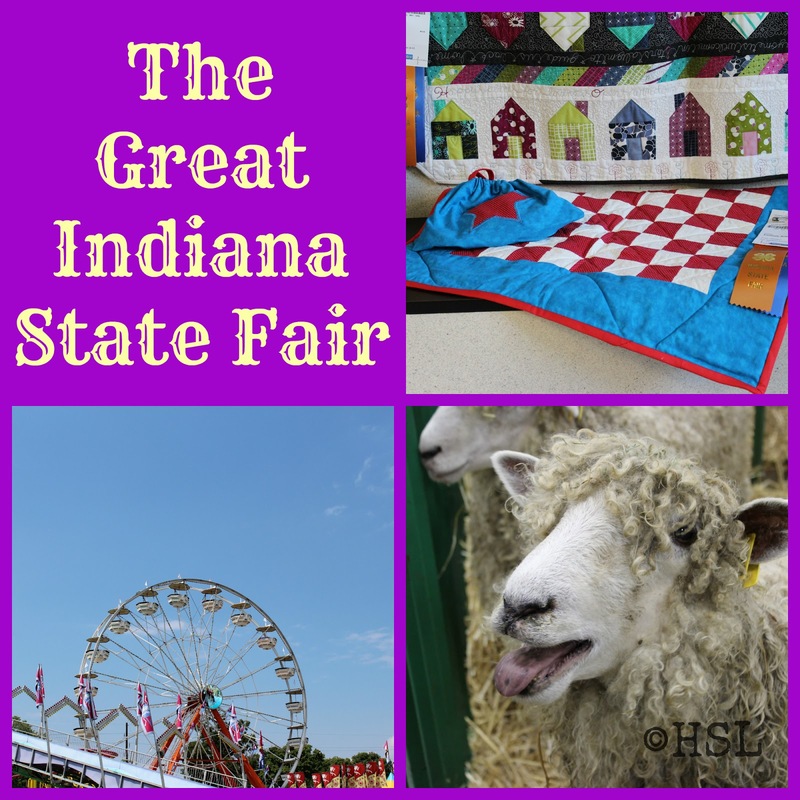 Whatever your choice for fun, you should be able to find it at the Great Indiana State Fair! If you're going this week ~ Admission to the 2016 Indiana State Fair is $12/person (ages five and under are free.) and parking is $5/ vehicle. Because there are so many great sponsors of the State Fair, there are several discounted admission days each year. This remaining for this year are: Tuesday 8/16 ~ Teacher Appreciation Day when admission for everyone is only $2, Thursday 8/18 ~ AAA Day when you can get free admission by showing your AAA card, Friday 8/19 ~ Fifth Third Bank Stand up to Cancer Day with $5 admission for everyone, and Sunday 8/21 ~ Mountain Dew day where you can save $2 off of admission by bringing any Pepsi Brand can. Take your hats and water bottles , wear comfortable shoes and sunblock, and be prepared to use your camera! 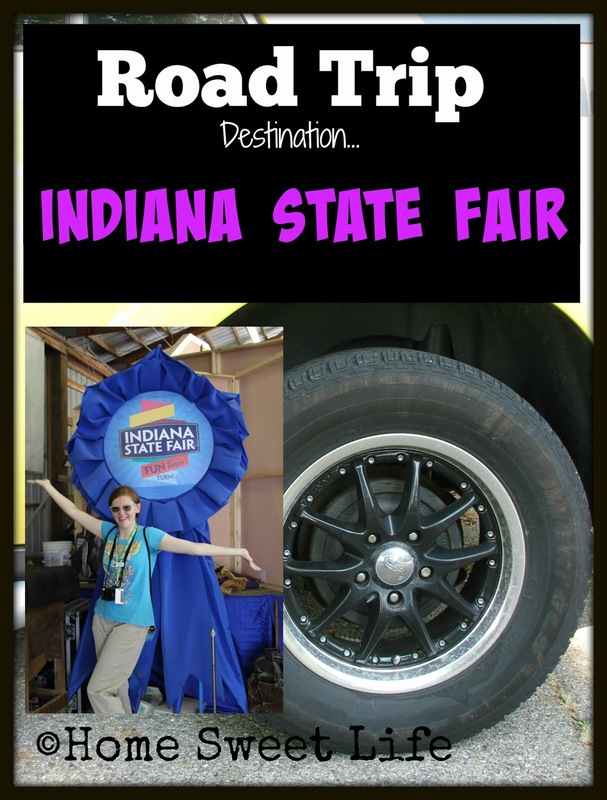 Have great time on your Road Trip to the Great Indiana State Fair! You just might see us there, as we'll be going again before the fair ends! Today I am going to break all the rules of the traditional 5 day long blog hop and post a sixth time. Yesterday's topic was encouragement. There was so much more that needed said than I had time for yesterday, but I didn't want you to think I had forgotten to write a post. 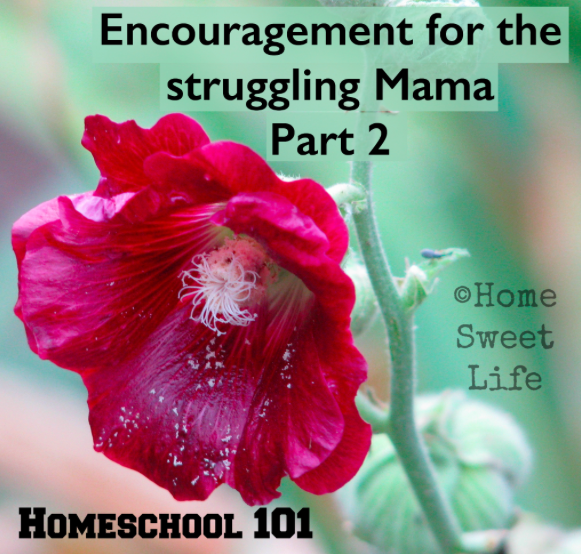 Encouragement is the thing we need most as homeschooling parents, especially homeschooling Mamas! Yesterday's post was a short shout out to those Mamas who are struggling. Whether you are struggling with children that don't want to do their math lesson, a new puppy that is making messes all over the floor, a teenager who cops an attitude every day, or just your own state of perpetual weariness, know this ~ you are not alone! If you feel like you're barely hanging on to the end of your rope, let go. I know this seems counter productive on the surface, but it is the only way to let go of your own plans and start listening to what God wants for your life. We often schedule out our days, but fail to ask God about His plans. His plans are what give us purpose and meaning. We often get so wrapped up in how we think our day should go that we balk if something strays off course. Here is a little synopsis that I hope explains my point. Yesterday was Friday. It was a day with only one two-hour time slot blocked out in our family calendar that the girls and I should need to attend to. I was planning to have the whole afternoon to write and the girls were going to have several hours to clean the house and do laundry. Hah! Like that was going to happen. First a text from Kurt ~ a gentle reminder that the weather forecast was changing -again- and the girls and I needed to make up our minds if we wanted to go to the outdoor concert or not . . . because it would likely get rained out on Saturday. Then, a small snafu in the morning appointment (dyeing yarn) that required more time to accomplish the task - a task that could not wait until Saturday because the yarn needed to be dry for Saturday's steps in the process. Thus our "free" afternoon turned into a race against the clock to get to the bank, get home, pack for the concert, get the laundry switched out and the dishes done...oh yeah, and write an inspiring post... all in three hours. Did I mention there is construction work on the highway (both ways) and we would only be home for 45 minutes? If we had panicked, ok, if I had panicked, because God changed our course for the day, everything would have come unglued and the evening would not have been spent enjoying an outdoor concert. I used to come unglued a lot. Just ask any member of my family. I'm trying to remain focused on what God is teaching me and staying put-together through His power and grace. Two passages of Scripture kept coming to mind yesterday... even before the craziness started! God was directing us in the way we should go. So we went! Today the next step in the yarn process went well. Today the girls are doing laundry and sweeping the house ~ hooray! Today this Mama is rejoicing that she is finally learning to follow God's plans instead of her own schedule. Some days are easy, some days are really stinking hard. But no matter what your day is like, know this: GOD IS ALWAYS, ALWAYS FAITHFUL! This homeschooling journey has brought me so many trials, but it has also brought more joy than I though possible! I have been refined. You will be refined if you choose to accept God's invitation to educate your children at home. Educating your children is important, but talking with them about our Great God is paramount. Your conversations about God need to be your first priority, whether they happen over breakfast, or at bedtime, these are the things your children will remember after they graduate. Why is it that teenagers always want to have deep discussions after bedtime? I don't know. What I do know is that it is important to take those opportunities to listen, to talk, and to pray with them. You can sleep tomorrow, or next week, but that conversation needs to happen tonight. Your Bible - when you are weary and burdened, read about Jesus and His grace (Matthew 11 &12.) When you are discouraged, read about Joshua and how God fought for the Israelites (Joshua 1-6.) When you are tired, read about not giving up (Galatians 6, 2 Thessalonians 3, Hebrews 12.) When you are longing for a rekindling of joy, read about The early church (Acts 2-4,) how they endured, how they worshipped, and how they loved one another. Your friends - when you need to feel the loving arms of Jesus through an actual person, spend time with your Christian friends. Friends that pray for you, and with you are a treasure beyond price. Friends that can manage a few extra kids thrown into the mix to give you even an hour or two of quiet once in a while are a great gift. If you are fortunate enough to have a friend who will occasionally invite you over for dinner, be sure to thank them! They can be a lifesaver in the vast ocean of life! Online homeschooling groups - there are dozens, if not hundreds, of really encouraging online groups as well as blogs to read that can encourage you along your journey. I would suggest you look around, and ask your friends for suggestions. If you subscribe to too many feeds, you'll never actually get around to homeschooling your own children, so be selective. I have about 5 or 6 that I enjoy getting emails from each week, and a few more that I visit from time to time to look up a specific topic. I have greatly benefitted from belonging to our statewide and local homeschool support groups. They keep us up to date on local events as well as what is happening on a state-wide level that can affect us as homeschoolers. Your spouse. Ok Mamas, let's get real here for a minute. 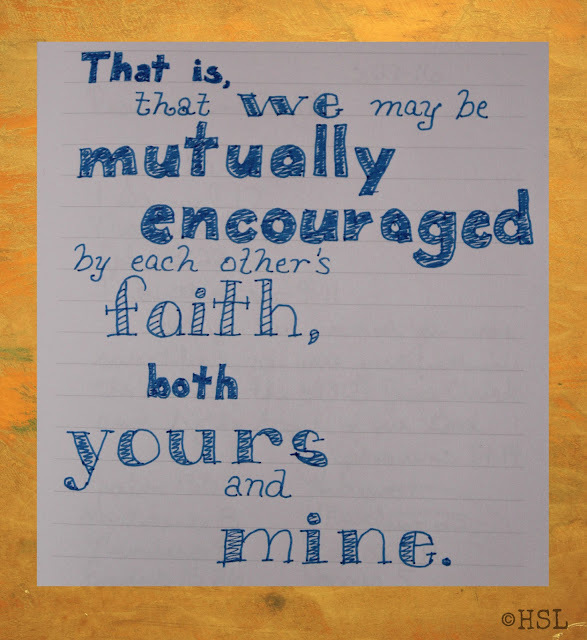 If you're not being encouraged by your spouse, it is way past time to take stock of what is going on in your marriage. Your husband is probably trying to encourage you in this journey, but maybe you're not listening very well. Or maybe, you've become so engrossed in your own little world that you've forgotten that He is supposed to come before the children. Go to God for direction, then go to your spouse and have a talk about how you two can get back to being each others' biggest cheerleaders. Sometimes you just need his big strong arms to give you a hug. Tell him so. Honest communication is the key here ~ speaking the truth in love. 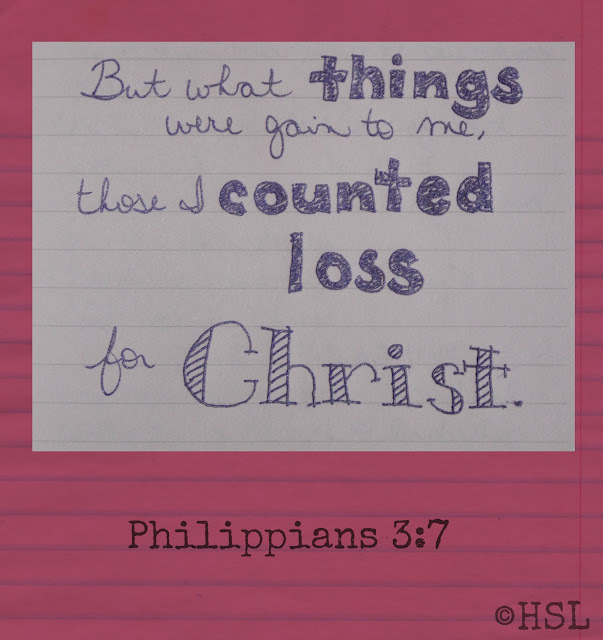 Sometimes, he might tell you that you need to cut back on something. Listen to him. He can tell before anyone else when you're stressing yourself out. He is also usually the financier of your homeschool, so ask for his help in making any big decisions. If you call him your "Principal" then trust him to make those decisions. Your journal. Remember that notebook you scribble things in? Go back and read it. You'll probably find answered prayers, small victories, and a reminder of your WHY for homeschooling. It's treasure just waiting for you. 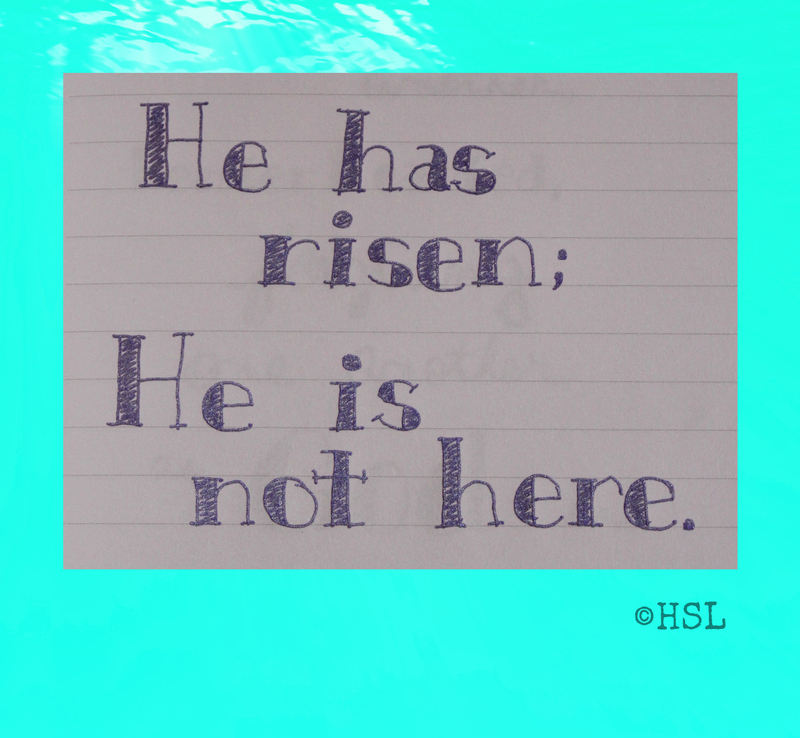 I hope you haven't minded a sixth day in the Homeschool 101 Blog Hop. I think I'm of a mind to go read some of my friends' posts from yesterday for myself! We all need some encouragement! He will carry you through this adventure called homeschooling. I have more to say tomorrow, but for today, know this: YOU ARE LOVED! 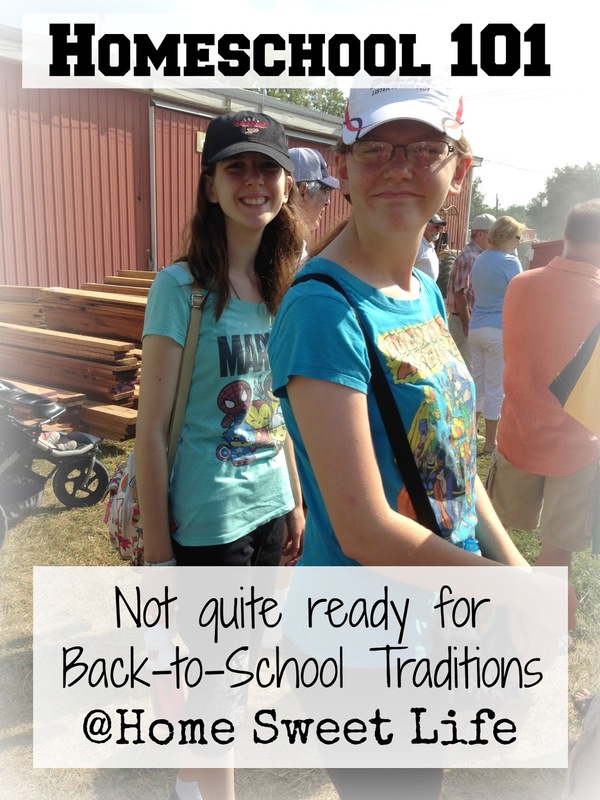 Today's topic for the Homeschool 101 Blog Hop is Traditions. For most families, that means they might talk about first day of school pictures, or special breakfasts they have every year. For us, it'll be about what we do when everyone else starts back to school and we wait until September. As I've been thinking about this topic all week, I can only think of three school year related traditions we have kept over our 14 years of educating the girls at home. 1- visit the State Fair during August, 2- start our school year the Tuesday after Labor Day, and 3- finish our school year in Mid-May with a Field Trip! If you were looking for great inspiration for how to create some family traditions of your own, you might want to click over and read the other posts for today. I'm simply going to share how these three traditions got started in our home and why we continue them today. Our State Fair is in August each year, and ever since Emily was a baby, we have made at least one trip to the fair as a family each year. Some years we go a lot, others just once or twice. Many times Kurt has only been able to go with us for one day, and the girls and I go back on another day to see more of the fair. Here is a picture from 2013. We were in the cattle barn, and the photo-op area for the participants wasn't being used...so we borrowed it. This will be our 14th year of educating the girls at home. We have started the Tuesday after Labor Day all but two of those years. One time we started a week early because I knew we were going on vacation the week of Labor Day and wanted the girls to at least get started on their math books before we left. The other year we tried starting around the 20th of August (like the public schools used to) but it felt like our summer was cut short, so we went back to the Tuesday after Labor Day the following year and have stuck with it. Life with your children is short. I know that can be hard to believe, especially when you're trying to help them learn to read, going through potty-training, or your oldest struggles with long division. Trust me on this, it goes by in a blink. You will teach your children a lot over 12 or 13 years, but they will teach you even more! The most important thing you can teach them is about the saving grace offered to them by Jesus Christ. Bookwork can only help them for this life, Christ changes their eternity. Don't get so focused on your curriculum and checking off the needed boxes that you forget to tie heart strings with them. Summer is a great opportunity to learn and have fun together, without needing to record it all in a planner. Go have fun! Schoolwork can wait, Summer will not! We love field trips! Experiential learning is our favorite way to learn as a family. It is nice to have an end date for your children to look forward to each Spring. If you can end your school year with a field trip, everyone can make cool memories to share over and over again. It uplifts both you and the children when you talk with friends and family about "that cool place we went" instead of summing up your year like this: "we FINALLY got to the end of our math books!" See what I mean? Much cooler to share about how you caught a salamander newt in the swamp, or met Mario Andretti at the racetrack! Whatever you decide you want to do for your family traditions, keep these two things in mind:1- If everyone loves them, continue them, if not, change them up. 2- choose loose traditions that don't cost much money so you can always look forward to them, without the dread of not being able to afford to do them again next year. 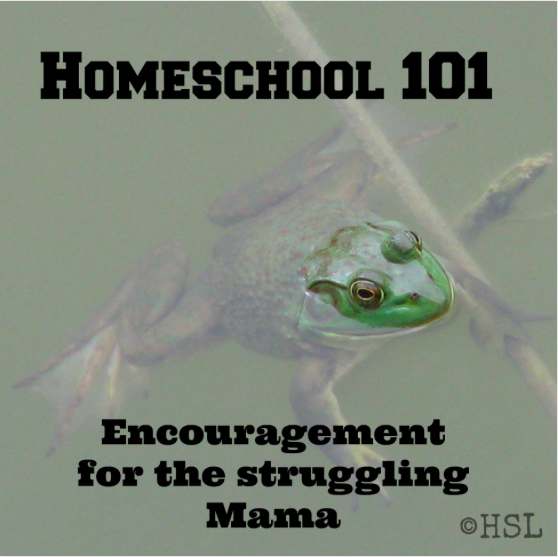 Come back by tomorrow for a little encouragement about finding the strength and patience to homeschool your children! Know you are loved! Yes, this is an actual picture of the floor in our front room taken the end of last week. Notice the layer of dust? See the 4-H ribbons, they're not attached to a project anymore, they're taped to the side of the chair ~ LOL! 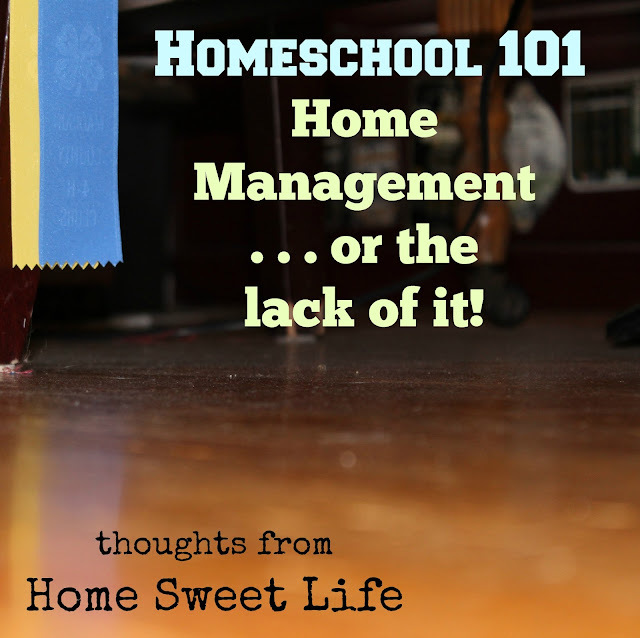 Why am I even talking about home management today (other than because it's today's Homeschool 101 topic?) Because Moms need to face reality that there is a balance between keeping a spotless house and keeping a loving home. Right now our home needs a good cleaning. The shelves and ceiling fans need dusted and the floors need swept and treated with some TLC. I'm OK with it not being spotless, because we've been living our lives, and trying to fit as much fun into the summer as possible. Sometime soon the girls will be home to help me clean (actually they'll be home tomorrow,) and we will tackle each task one by one. But right now, the dust is accumulating. Because the girls have been on an adventure for the past two weeks. Before that was our county 4-H fair (which actually encompasses three weeks when you figure in all the days of judging and preparation or fair week.) So yes, its been 5 weeks since we did a good, thorough deep cleaning. Don't worry ~ we've still been washing the dishes, doing the laundry, and cleaning the bathrooms. We've just let some of the other things wait for us. I am a working and homeschooling Mama. While the girls don't usually do much schoolwork in the summers, I still need to work three days week. Since they've been gone the past two weeks I've lost my laundress, my dishwasher, and both of my part time cooks. Yup, you guessed it !Kurt and I have been practicing being empty-nesters. It's been really quiet, and I've been reminded how spoiled I am by having the girls help so much at home. If you're wanting to get some ideas from those Crew members who actually DO plan their home management, feel free to click over and read some of today's other posts. In the meantime, know that I'm right there with you ~ balancing the demands of home, school, work, and family life one day at a time. Feel free to stop back in soon, maybe the floors will be sparkly by then . . . and maybe not. We might decide to go to the park instead! Have a great day with your family! I'm sorry, I just could NOT resist adding a rosy glow and sparkles to the picture for today! So many people start planning for homeschooling with rose colored glasses on and forget to wake up to the reality of every day life and the need to be realistic, and faithful, in their planning. Homeschool planning can be all rosy and sparkly eventually, but probably not the first time you try it! So go get a planner, any planner will do, because we are going to talk about the reality of pencil on paper planning and how to make it work for your homeschool instead of against it! First, you need a general plan. I used to start by writing a list of things I hoped to cover with the girls in the upcoming year. While some of you may think this simplistic, it was, and still is, my starting point. Even though the girls are both now in High School, I still want to make sure we have a general overview for where we want to focus for the year. So how do you make your general plan? I went digging and found the beginning of the year notes I made for Emily & Arlene in the summer of 2008. If you're planning something similar to this for your child, then decide if you want to cover all of these topics all year long, or if you want to work on one or two things at a time for a month to 6 weeks at a time. This gives you a general way to plan out your year. If you're planning six things to focus on for the year, you might want to pick one or two that you want to work on for the whole year. For Emily, that was spelling and writing short stories. The other four topics we worked on for about 6 weeks at a time. Ta Da! You've just made your own lesson plan for Language Arts. Now, if you're using a prepared curriculum, it probably comes with lesson plan suggestions. Remember that they are only suggestions, and you should feel free to adapt it to work best for your child. If the plan is for language arts five times a week, but you're only going to plan on bookwork four days a week, you'll need to decide if you want to spend more than 9 months on it, double up one day a week and do two lessons, or (my favorite) plan to only do 80% of the book. Or not . . . depends on your teaching style. If you really like to plan, you may get out your planner and write down what lesson you should be doing in each subject every day for the first semester. It might be better if you just write the lessons down for a week or two at a time. Why? Because life happens. If you write your lesson plans in pen, will you be willing to change them if a cool field trip opportunity comes up? What will you do if Dad takes an unexpected day off or your child has a stomach ache? Don't be in love with your planner, be in love with your children and your life. Ok, so what happens in High School ? Planning can be a bit more challenging, especially when you're wanting to make sure they master enough material to earn credits towards their diploma. Here is what we did: look at our state's basic requirements for graduation (and a general diploma.) I took a blank piece of paper and sketched out what I though Emily should cover each year to get through her required classes. Each summer I would compare what she had completed to the plan we had mapped out. It told me if she needed to do more or less for the following year. How did this work out in reality? Fairly well ~ except there was one Spring when Emily got behind on some of her courses, because Kurt was really, really sick and ended up needing to have his gallbladder removed. Think about it ~ homeschooling gives you an opportunity to adjust. I could have pushed Emily through just to mark off the boxes, or we could choose to adjust the plan to give her time for mastery. So Emily is spending an additional semester in High School, because mastery is much more important than an arbitrary number. We have a general plan for Arlene too. It shares a lot of similarities to Emily's since they're both based upon state requirements for graduation, but it fits Arlene's individual interests. Whether you're just getting started, or getting into the nitty-gritty of High School, know that planning needs to happen, but needs to be flexible. Use a paper and pencil. 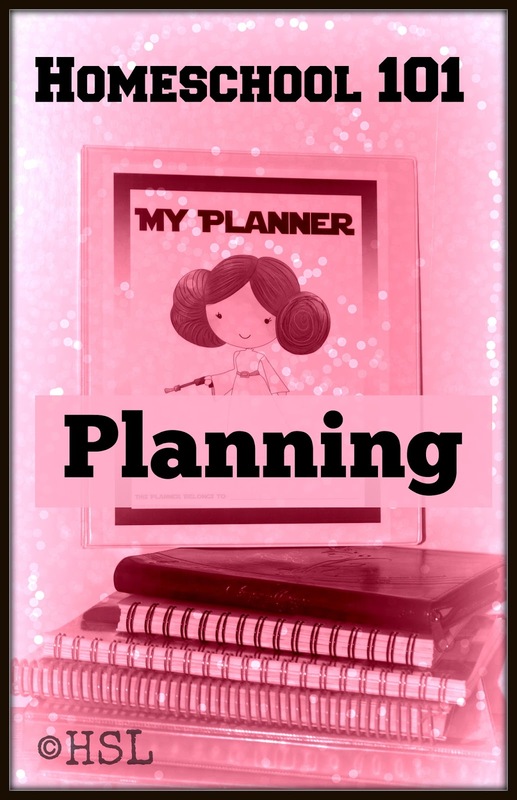 Choose a fancy planner, or a simple free printable one. What matters is that you stay flexible and keep the focus on the relationships you are building with your children as they learn, not the boxes you check! Find out how other Crew families do their planning. 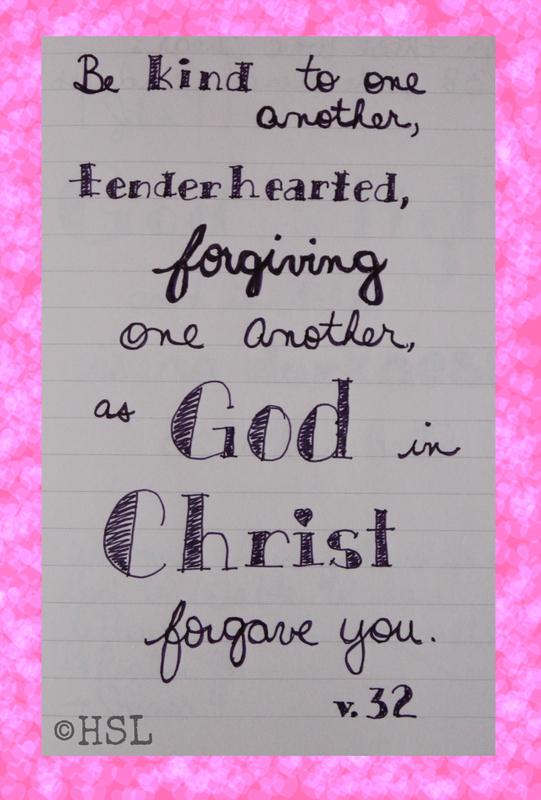 Click on over and read today's other posts! Last week I shared a little about how to begin homeschooling, and some basic homeschool supply lists. 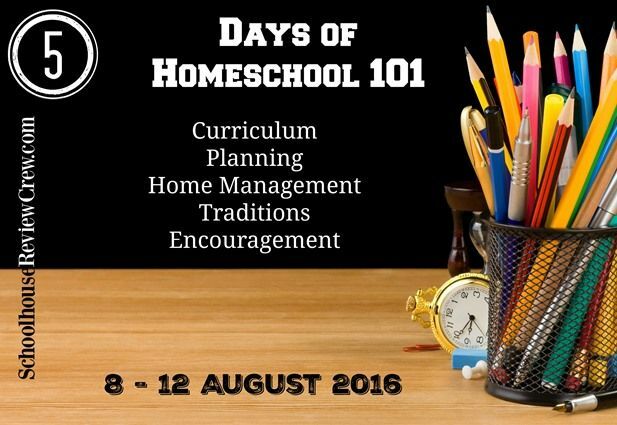 Today (and all this week,) I'm joining with other members of the Schoolhouse Review Crew in the Homeschool 101 Blog Hop. Just in case you've never been to a blog hop before, we are all blogging on the same topic each day of the week, but from A LOT of different perspectives! This gives you an opportunity to compare how we do things here at Home Sweet Life with dozens of other homeschooling families and how they organize their days and educations. If you've already read last weeks' posts, you'll remember I posed the question on Wednesday about whether or not you really need any curriculum to homeschool. That will be where we start today. Do I actually need curriculum to homeschool? That depends on several things, but here are the two main ones: are you recreating "school at home" or are you simply educating your children? If you are going to recreate what you know of a traditional schoolroom at home, then yes, you'll want some curriculum, and we'll talk about that first. If you're wondering about simply educating your children, we'll get to that soon ~ so hang on! If you are envisioning a "school at home," you'll be needing some curriculum. You can choose to buy an all-inclusive curriculum, like Memoria Press, Abeka or BJU press Homeschool where you can buy everything you might ever need in the way of textbooks for your student for this year all in one bundle. There are several homeschool companies that have a full-year bundle for every grade level. Warning: this is going to get expensive, especially if you have multiple students, so budget accordingly! Here is an example: our youngest, Arlene, is 16 and will be starting her 11th grade year this fall. If I simply purchased the all-in-one grade package (with student and teacher books) from the three above mentioned companies it would cost us: Memoria Press (Ninth grade is $825.00 ~ higher grades are put together by subjects and times you haven't already covered, so they vary,) Abeka 11th grade $674.70 , and BJU 11th grade $778.35. Are these normal prices for an all-inclusive curriculum? Yes. Can you often find the same books at Christianbook.com or used for less? Frequently. It is still a lot less than sending your child to private school, but it can get pretty expensive. What if I don't want to buy curriculum, or cannot afford it? Good news! You don't need a lot of money to educate your children at home! (Now before some of you go crazy, let me mention there is middle ground, and I'll talk about it last.) We live today in a world of free or almost free online courses, videos, free printables, free e-books and a gazillion blogs that can help with finding free resources for just about every type of learning style you might want to consider using to educate your children. Even when our girls were little, there were a TON of resources available at our local library that we used over and over for their education. This was back in the days of dial-up internet, so we stuck with weekly trips to the library. Our local library even has a section of curriculum, so sometimes I would check a book or two out from there and see how other people taught various subjects. We used Charlotte Mason's methods of teaching for our main philosophy of education. They included living books, nature study, short lessons, and daily time spent outdoors. While I'm not a CM purist, I do think our girls received a grand and varied education by using these guidelines. We still use a lot of these four principles (she had others too) today with their High School level work. If you would like a condensed, layman -term explanation of Charlotte Mason's educational philosophies, read Karen Andreola's A Charlotte Mason Companion. That book is worth its weight in gold! I have lost track of how many times I've read my copy. There are also lots of great websites with booklists that can help you decide what to use for your curriculum, or lack of, in your children's education. What about a compromise in curriculum use? This is a very valid point! Don't shoot me Mr. Pudewa for using the word very, it fits here! Many, many families we know use a combination approach to their children's education. We have had years when we used virtually no curriculum (except math ~ I really think most people should stick with using a math curriculum) and years when the girls had a book or two for almost every subject. The thing is, those books were not always textbooks. Some of the best choices you can make for your children have to do with the quality of the books you place in their hands. If your children love animals, choose science books about animals for them to read. If they're in elementary school, you can choose a science book from a Christian publisher, or a secular one, or you can choose a video or online series about biology, OR, you can just go on down to your library, start in one end of the children's science biology books and read about whatever animals catch your fancy until you get to the other end. In our home, we chose random animals to read about each week in elementary grades, and didn't actually use curriculum until 3rd grade, when we purchased a used copy of the God's Design for Science series at a yardsale. We used this as a starting point, and for some ideas for cool experiments. We still read lots of library books about plants and animals. Most of what your child should probably learn in the elementary grades can be learned from a library book, or fifty. The rest of it you can teach at home, and from your Bible. 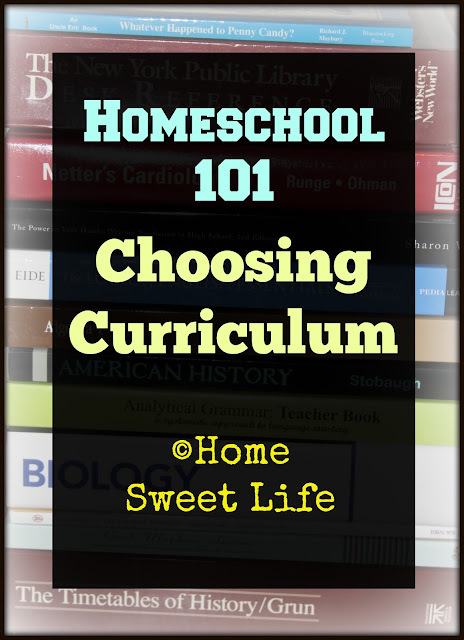 If you are new to homeschooling this year, my #1 word of advice is this: buy as little curriculum as possible! Spend time with your children, learn and investigate together. Read aloud a book or twelve. Work together in the kitchen and out in the yard, go on a lot of field trips. There will always be time to add in more curriculum if needed, but if you don't set the pace for a relaxed homeschool where learning is fun and field trips are regularly taken, it will be really hard to change course later. I know some of you live in states that require curriculum for each subject. Be creative when you can, and buy gently used if possible. Remember your WHY for keeping your children at home for their education, and you will enjoy the journey so much more! I know I've talked for far too long and only scratched the surface of choosing curriculum! I would love for you to leave your questions in the comment section and I'll try to answer them individually. For other articles about choosing curriculum and other related topics, you can read some of our other posts: Choosing Curriculum, Tips for the Elementary Years, Planning for High School Curriculum, or Real life Homeschool. I am not a curriculum junkie. But I do know of two outstanding resources to point you to before you decide on what you might want for your homeschool. Diana Waring is an awesome lady who I count as both mentor and friend. Check out her blog and read the articles about the eight different types of intelligences. 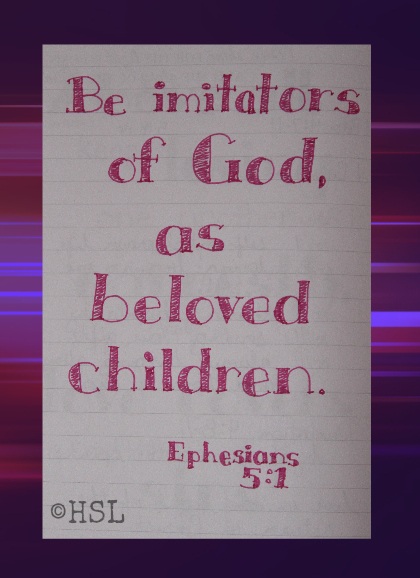 They will help you see your children as the masterpieces God has made them to be, and it can give you some insight on what to do, and what not to do, to help each child succeed. Another fantastic resource is Cathy Duffy! She has been reviewing homeschool resources since back when I was in Middle School! I think she has the most exhaustive list that categorizes curriculum by learning type and grade level to help you choose wisely. I know, I should have put in more pictures to entertain you along the way during this post...but I didn't. 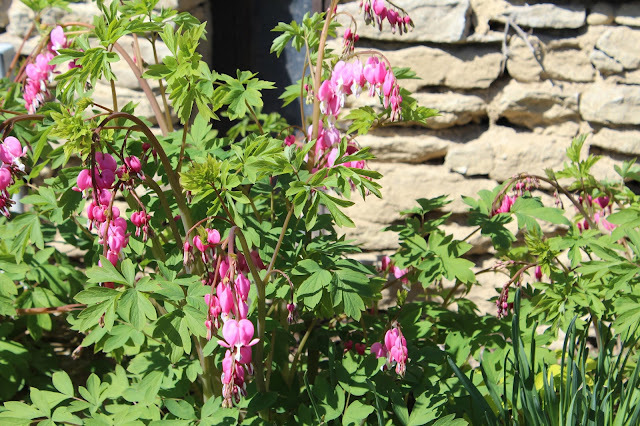 So here is a picture of some lovely bleeding hearts I found outside a castle earlier this year to cheer you up! Come back in September to read about the castle in our Road Trip feature! Click on the link below and see what all the other members of the Review Crew have to say about curriculum. I'm sure you'll find a few that inspire you! We'll see you back here tomorrow as I talk about planning. Read more about curriculum choices at today's group link-up!